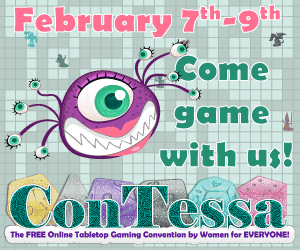 ConTessa, the online game convention is this weekend. You should sign up. Events are for everyone! Online conventions are awesome and a great way to grow the hobby. You can play a game you've never tried. You can play with people from all areas of the word. ConTessa has a great roster of games this year. Check out their list of events. All players are welcome. Game and have fun! For more info go to contessaonline.com.